In the previous parts of this post I reviewed three different development environments for Haskell: Emacs, EclipseFP and Leksah. 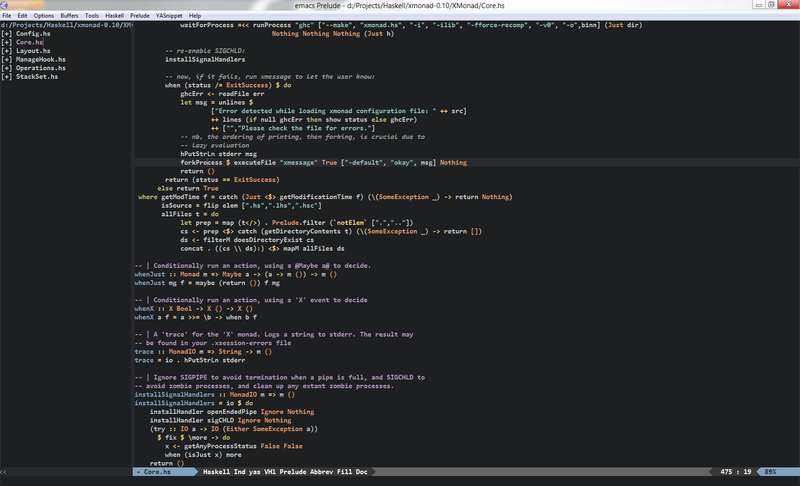 This is the last part in which I plan to write about Emacs once again and then summarize all the reviews. IDO mode. IDO stands for Interactively Do Things and it greatly improves file opening and switching between buffers. When opening a file it shows the list of files and directories in a current directory, allows to navigate the directory tree in an easy manner, provides intuitive filtering capabilities and allows to select a file easily by selecting its name using arrow keys. Similar behaviour is provided when switching between opened buffers. A nice introductory tutorial to IDO can be found here. NumberedWindows improves switching between multiple windows by pressing the Meta key and a number of a window1. This is much easier to type then C-x o.
CycleBuffer allows switching to next/previous buffer using F9/F10 keys. That’s an alternative to IDO-enhanced C-x b command. These three extensions are a huge win. They greatly improve overall Emacs experience. There’s plenty of other window- and buffer-enhancing extensions that I haven’t mentioned – you can take a look at them on Emacs Wiki here and here. Right now I’m missing two things in Emacs: a bit tighter integration with GHC/GHCi and a possibility to browse through the source tree. First problem should theoretically not be a problem, since haskell-mode and ghc-mod both offer good integration features but, as I mentioned in my review, some of these features didn’t work as the should or at all. I hope this could be resolved with a small effort. As for the source tree browsing, there are of course extensions. One of them is ECB, but I haven’t tried it yet. This series was meant to give you a rough idea of what three Haskell IDEs – Emacs, EclipseFP and Leksah – have to offer. As you’ve seen I was enthusiastic about EclipseFP and Emacs, but very critical about Leksah. I would however suggest not to rely solely on my opinion and test each of these environments on your own. I’ve seen people on #haskell praising Leksah, so perhaps that project is not a lost cause (as my post could have suggested). I also made one omission – vim. There are Haskell modes for vim as well, but I’ve never been proficient in it so when I was faced with improving my vim skills or learning Emacs from scratch, I chose the latter (I think the key factor was the fact that I was learning Scheme at the same time). As a general thought, I have to say that there is no Haskell IDE that would boost my efficiency as a programmer the way Eclipse boosted my Java programming efficiency. I don’t know if such IDE will ever be created, but it would be nice to have at least any kind of refactoring capabilities. At the moment none of the IDEs has such and the programmer has to manually perform repetitious tasks like renaming variables. I’m definitely waiting for this to improve. Get the latest emacs 24 snapshot, then get emacs prelude–it gives you non-awful defaults. Now install sr-speedbar. Haskell-mode will be automatically installed when opening a haskell file. If you want ghc mod, use M-x package-list-packages and find and install it there. I’ll upgrade Emacs when the new release of openSUSE comes out (in a month or so). Are you using Solarized colour scheme? That’s sanityinc’s tomorrow theme. Use M-x package-list-packages and you’ll find it there. M-x customize-themes to check out your installed themes in emacs 24. I’m also using powerline.el in that picture.